Classified by the United Nations as a supercrop, quinoa can play an important role in our vegan diet. Quinoa contains a balanced set of essential amino acids, is a good source of dietary fiber and phosphorus and is high in magnesium and iron. This salad is an adaptation of a recipe that was on fatfree.com. Submitted in 1999 by joy’s diner. Wash the quinoa in a sieve using cold water. Wash it well, as during storage it gets an oily coating which tastes bitter. Put the washed quinoa in a small pan. Cover with water and cook until soft, about 10 minutes. Meanwhile, peel and finely slice the baby carrots. Chop the mint and make the salad dressing. When the quinoa is cooked, drain and place in a serving bow. Put the quinoa in the refrigerator to cool down. After 10 minutes- half an hour the quinoa is cool and you can add all the ingredients together. Mix well and return to the refrigerator to season. Serve the salad on a bed of lettuce, or alternatively in orange cups with a garnish of mint leaves. You could also use canned mandarin oranges as an alternative. They are milder than the fresh oranges but quicker when short of time. 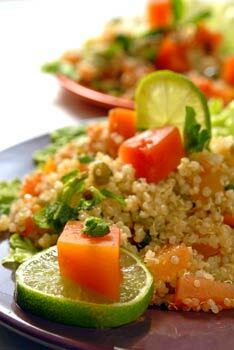 Posted by Chris Walker on February 22, 2007 in Orange, Quinoa, Salads.